Omega Constellation Collectors: Acquiring a Factory Original Omega Constellation - Is It an Achievable Dream? Acquiring a Factory Original Omega Constellation - Is It an Achievable Dream? How can you be absolutely sure you have a factory original Constellation? This is a question I field regularly from subscribers to this blog. The answer to that question is that you can’t, except on rare occasions. Crowns and crystals on a well-serviced vintage watch will probably have been changed over time. Damaged or degraded dials were routinely replaced during service when genuine replacements were still available; rotors, rotor posts in some models and rotor bridges were swapped when supplies were plentiful, and other worn parts were exchanged for new. 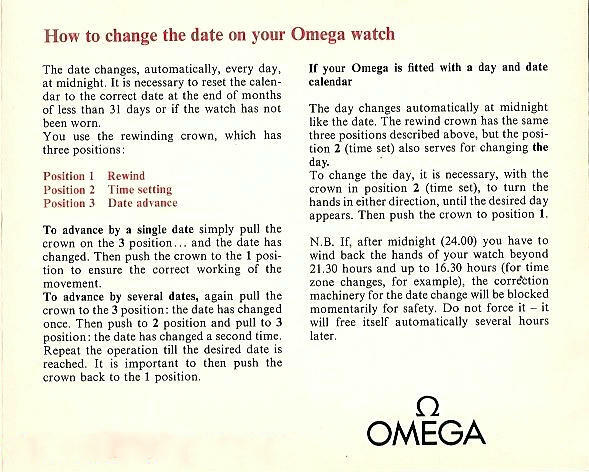 Service bulletins of now vintage Omega watches outlined clear regimes of servicing that included the replacement of sub-standard parts and indeed recommended replacement of some parts at every service irrespective of their condition. Basically the idea was that, after servicing, your Omega would be returned looking as new as was possible. Same thing happens today on contemporary Omega watches. This tradition of replacing old for new in watch servicing and maintenance serves the owner well as long as the model remains ‘factory supported’, when replacement parts are plentiful and the watch is a contemporary model. 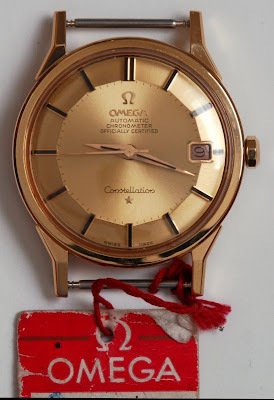 However, as a watch edges into vintage status, supplies of some parts become scarce, the factory stops manufacturing replacement parts and, in the case of Omega vintage watches, the factory will replace worn parts with the nearest available fit and will refinish dials it believes are not up to a certain standard. This is why I recommend owners of vintage Constellations do not have their watches serviced by Omega in Bienne or an Omega agent, but source a reputable watchmaker who will preserve as much of the ‘originality’ of the watch as possible. To return to the original question, it is possible, but not easy, to acquire a factory original Constellation (as the above picture attests). Infrequently a genuine new old stock watch will emerge from a dealer’s safe after his passing; occasionally a solid gold ‘years-of-service’ watch will surface after decades of preservation in some dark cupboard space, and every now and then one comes across a Constellation that has been only worn by the owner on special occasions and retains most, if not all, of its originality. These pieces are very special and difficult to find. 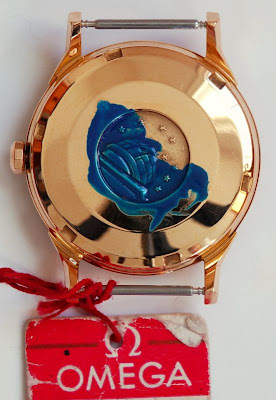 For most collectors of vintage Constellations, factory specification, as opposed to factory original, is a satisfactory compromise at which to arrive. As long as the dial is original to the watch and not refinished, as long as all watch parts and case comply with factory specifications for the model, and the signature parts have not been disturbed (train bridge with serial numbers that match case and calibre) they are happy with their acquisition. Box and papers are an added bonus as the papers confirm serial numbers and provenance. The factory original, if and when it comes your way, is an event worth celebrating. In the meantime, Constellations that meet factory specifications will continue to appreciate, be highly collectible and satisfy the collector’s thirst for the genuine article. How much is the Constellation in the above picture worth? Given that there are basically three markets - global internet, auction house and bricks and mortar dealership - we need to split the difference. If this watch came up in Southeby's I would expect collectors to be paying up to five thousand for it. I completely agree with your article and people are starting to understand why some collectors and some watch restaurateurs pay more for a used but good condition part than a similar new one from Omega. I, personally prefer a 50 years old watch looking as a 50 old watch, showing the normal marks of use and age. A aged dial doesn't match with new hands as old watch doesn't match with a new look. Its how I see it. It is amazing to open a 60 year old watch, with worn case and dial by all those years of wear, and find a movement beating as new and retaining some decent accuracy. All the the marks hare a proof of his history. You have the case of the famous SM300 assembled with NOS parts in Australia. Are they really vintage Omegas? Yes I know the people at Watchco and from what I understand they bought up some time ago the entire inventory of an Omega parts agent overseas rather than Australia. Some of the watches actually meet factory specification and now that parts are dwindling some case numbers have the wrong movement. Yes, this watch is from a collection. Thank you for this great site, i have inherited a solid gold omega constellation and after digging around your website it seems to be De Luxe 14394 calibre 561. Its dial has a aged effect a patina if you like which i intially thought were stars due to the constellation theme. This watch has been in my grandmas closet for close to thirty years, i shook it and its keeping accurate time. Nonetheless i want to give to an omega shop to clean it up and add a new strap and such. But since i live in egypt i dont trust omega to not mess up the watch unless given strict instructions. May i email you pics of the watch so that you could tell me how to go about restoring it. Whats amazing is that i shook its still working, thats got to say something :). Nice to hear from you Monir. Yes these are remarkable watches. Happy to have a look at it for you so as to determine what the best restoration action is. This information was provided by the local Omega Store in Chicago, USA. The store suggested that I get the watch serviced. They said it will be sent to Switzerland and get services for US$ 710 and then come back with a 2 year international warranty. So I have two questions for you. In your expert opinion, should I even bother to get the watch serviced? Will servicing lower the value of the watch as it replaces original parts with newer spares? How much is the watch worth so I can determine if servicing it for $710 is financially worth it? I'll greatly appreciate any suggestions you can provide! Sending the watch to Omega in Bienne would be one option, but it is the most expensive option . Parts replacement does not necessarily devalue a watch as long as the parts are genuine and correct for the model. I have my late father's 1966 stainless steel pie pan constellation cal 564 movement 24.764.150 case no. 168.005. The watch has not been serviced previously as far as I am aware and all parts are original. I was immediately taken by this watch not only for the style but also this amazing piece of Swiss engineering kicked into life immediately after many years in storage. The case is scratched, tarnished and dented, glass scratched, bracelet scratched, tarnished and dented and the dial is oxidised. I have received a restoration quote of £1020 to restore the dial, finish the case, replace the crown and glass and service. It is a lot of money. I am concerned about the cost and whether it is worth it. And if I go ahead are there going to be replacement parts that compromise the integrity of the original piece. Is there a good watchmaker who is experienced with these timepieces that I could get a second opinion in London/South of England that you know of? Hi, a thousand pounds appears to me to be quite extraordinary. I assume that this refurbishment would be by the Omega factory in Bienne? I generally do not recommend sending vintage to Bienne because of the expensive and not necessarily sympathetic refurbishments Omega does. Their service ethos is better fitted to new timepieces rather than vintage where as much originality as possible should be preserved. In the recommended repairers column opposite there are three repairers that I know have solid reputations in careful restoration of vintage. You definitely need a second opinion after the shock of the first quote. If you wish to send some pics, click on the :view my profile" on the RH column and then the email link. I have just bought a 1961 (I think!) Constellation. Case number is 14393/61/SC and movement number is 19439915 (calibre 561) Apparently it is gold capped. Could you kindly tell me if it is a solid gold bezel ring ? I believe it to be 18k Many thanks, Bobby. Yes, you're right. The bezel is solid gold, and on gold capped examples it is 14K, same as the case back medallion.